The Turin 800 x 400mm Minimalist High Gloss White Vanity Unit with Ceramic Basin, make the most of your bathroom with our practical and attractive furniture options. 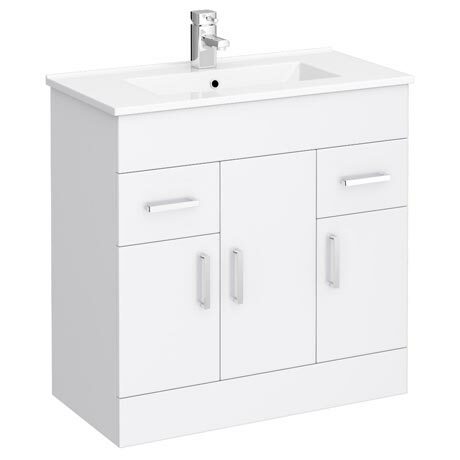 All minimalist white gloss vanity units feature a high quality ceramic basin. Can be used in conjunction with furniture from the Modena range. The basin has a built in overflow that is for use with a slotted basin waste. 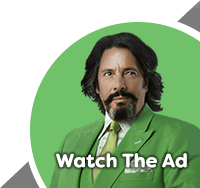 The waste is sold separately and can be purchased on our website. Unfortunately we do not supply this item in 900mm. Q. What is the internal length and width of the sink? HI Helen, yes, this vanity unit and basin will come with 1 pre drilled tap hole. Thanks! Q. Does this come with chrome plug and overflow covers/system, or do I need to buy separately? Q. Please can you tell me depth of the basin. Thank you. Hi, the Modena Ceramic Basin has a depth of 140mm. Thanks. Q. Does this unit come in 700mm width? Looks good in downstairs wc. "Well designed, high quality cabinet and sink at a very competetive price." Great unit. Looks very stylish. Have been looking for a long time in a lot of different places for a unit and this one is the best i've seen. Pleasant staff in Formby showroom. Many thanks. We actually saw this unit in a local bathroom showroom and really liked it. The size was prefect for what we wanted, but the price was a little on the high side. Shopping around we found the same unit from Victorian Plumbing and the price was much better :0) It arrived on time as described, so no complaints from us. Would definitely recommend VP to friends. Never having used victorian plumbing before I wasn't sure what to expect. I need never have worried, the quality of the product is great and now that my plumber has installed it into my en-suite bathroom it looks amazing! I am absolutely delighted with my purchase and most definitely the price paid, which I have to say, after trawling the internet for days, could not be beaten. Good after sales service and was happy with the delivery. Overall, fab! Would definitely recommend and would almost certainly use again.